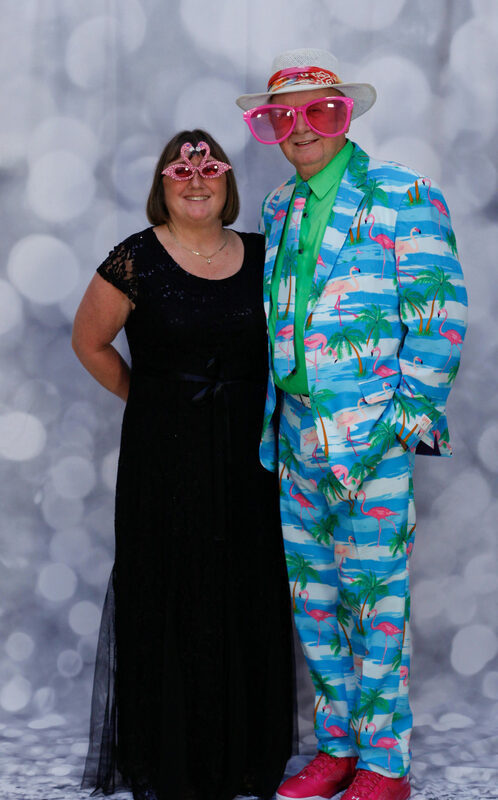 Chuck Blocher and Donna Cole, a fun-loving couple, always look for new ways to make each other laugh. Ten years ago, Donna bought Chuck six flamingos for Valentine’s Day. They would move the flamingos around their front yard on Black Lake Belmore Road periodically over the years, making up little stories about what the flamingos were doing. A turkey would chase the flamingos; then the flamingos would surround the turkey. “As if to say,” Donna explains, “what sort of bird are you?” But as far as the couple knew, no one else really noticed. “We were just having fun amongst ourselves,” she says. Then one day Chuck and Donna woke up, and five of the flamingos were gone. Someone had stolen them. Donna was upset, so she painted a bright pink sign that read, #BringBackOurBirds and set it up facing the road. People they had never met before started dropping by and giving them flamingos. They went from one flamingo after the theft to 22. “That’s how we found out people paid attention,” says Donna. One morning, with all the birds lined up in formation, Donna and Chuck found yet another new bird off to one side facing the group. A note was pinned beneath its leg that read, “Can I join your flock?” Another day a man showed up with several black zombie flamingos sporting red eyes and vampire teeth. The new flock has carried on with their antics, bringing cheer to passersby. Last spring a mother flamingo sat on a nest of colored plastic eggs. “And we painted a pair of ceramic ducks pink,” says Donna. Those became the chicks. Gradually the displays have become more elaborate. The couple tries to relate the scene to the season and holidays and are always thinking ahead and looking for new props. Donna found that tiny hats and scarves made to decorate wine bottles fit the flamingos perfectly. 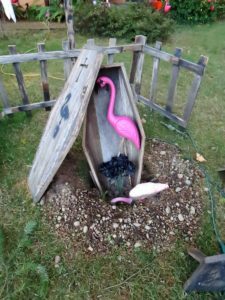 A woodworking friend has built several items for the flamingos like a coffin for Halloween and some pink, striped skis for winter recreation. When Thurston County hung signs warning of road construction, Donna ordered little yellow construction helmets online. She bought mini traffic cones, and their friend made a construction barrier with pink warning stripes instead of the standard yellow and black. When the road crews arrived, the flamingos were ready to supervise. 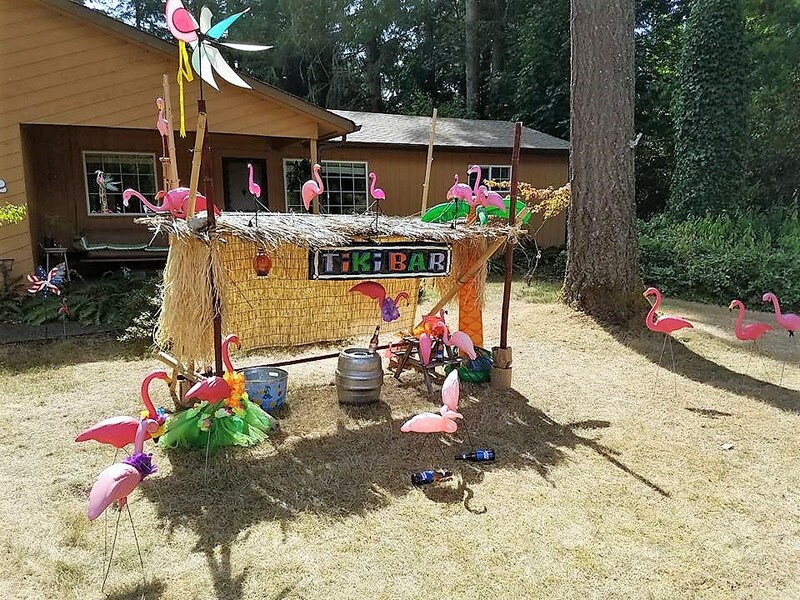 The flamingos have made time for fun over the summer as well, dipping in an inflated pool, celebrating the 4th of July and lounging at a tiki bar. After the tiki party, the flamingos got busy fixing some plumbing in the front yard that required digging a hole deep enough for the birds to get in and “work.” The hole next served as a burial site for Halloween. There are enough birds for a game of football in the fall, and they will be getting into shape to pull Santa’s sleigh again in December. After that Donna says that the birds are set to go skiing if we get enough snow. 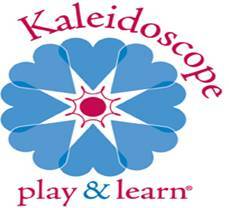 “It really has grown into something that people enjoy,” Donna shares. People often slow down while driving by and tell Donna how much they enjoy the displays when she is out working in the yard. Sometimes someone will park at the fire station next door and walk over to take pictures. Fans have sent cards, letters and flamingo-themed gifts to express how much they appreciate the smiles the birds bring to their faces on the drive to and from town. It is not unusual for Chuck and Donna to come home and find a flamingo motif present on the porch, a wind chime, a welcome sign or a shopping bag to add to their collection of pink birds. You can follow the flamingo exploits yourself on their Facebook page Flamingos of Black Lake or drive by to see what the birds are up to at 4412 Black Lake Belmore Road. The best way to view the birds is to drive south on Black Lake Belmore Road. Chuck and Donna live on a tricky “S” curve, so drive safely. Though it might be tempting, do not stop on the road because there is not much of a shoulder, and visibility is poor around the bends for oncoming traffic.